Are Walking Dead spoilers protected by copyright law? The Walking Dead sent a shockwave through the internet with its sixth-season finale—one that persists after five months of videos and articles that attempt to sleuth out the cliffhanger’s resolution. 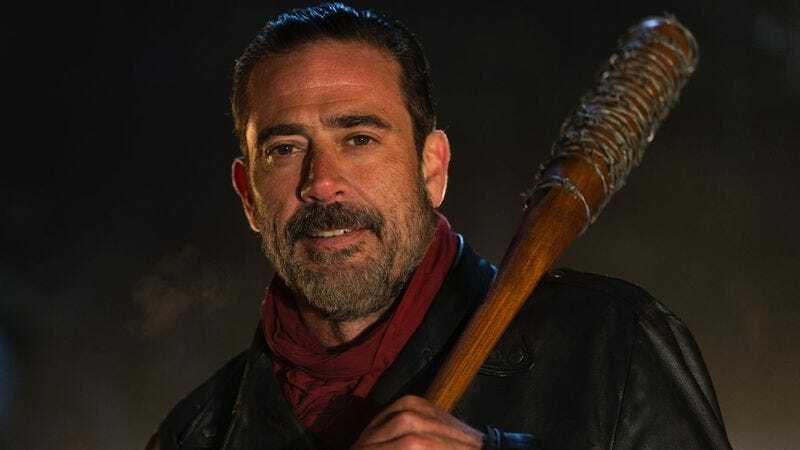 Villainous Negan (Jeffrey Dean Morgan) brought his barbed-wire-wrapped baseball bat (which he calls “Lucille”) down on the skull of one of the show’s heroes, and fan outcry over the ambiguous ending has given way to speculation that rivals the Zapruder film in its intensity. Everything is up for analysis, from a particular actor’s hair color at a Comic-Con appearance, to the angle of the shadows across Negan’s body as he swings. This clamor for information has only intensified as AMC releases promotional materials for season seven, including a trailer that has, as of publication, racked up nearly 6.5 million views on YouTube. No doubt that the followers of one popular online community expected to be delivered from a summer of angst and uncertainty. And then one young viewer declared that The Spoiling Dead Fans would be posting the identity of the poor soul who slaked Lucille’s thirst. (TSDF moderators have since stated that the fan had no affiliation with the site or its leadership.) So AMC took its own hard swing, cracking down with a cease and desist order that threatens TSDF with legal action, on the grounds of copyright infringement, if it releases the identity of Negan’s victim online. In a message informing fans about the cease and desist, TSDF lamented, “Basically what it all comes down to is if we post our Lucille Victim prediction and we’re right, AMC says they will sue us… If someone brings us a potential Lucille spoiler and we confirm it and it turns out accurate we could get sued.” This seems like a David-vs.-Goliath of online geekdom—a bat-toting cable giant bullying a smaller, scrappier, and yet nobly pure-of-heart fan community—but is it? HBO has not been shy about issuing cease and desists of its own: not only the individuals suspected of pirating or leaking episodes, but to a Spanish YouTube prognosticator called Dr. Jose Senaris. In his videos, Senaris offered speculations that were too eerily accurate to be guesswork alone—and he would later confess, in a subreddit devoted to Game Of Thrones spoilers, that he did indeed get emails from a source directly affiliated with the show. This prompted HBO to send a copyright claim against one particular video, even though that video didn’t contain any new or unaired footage. Which raises the question of how, exactly, we can process the reasoning behind these claims. Hypothetically, TSDF could argue fair use—which, generally speaking, is about using copyrighted material for “transformative” purposes, with “transformative” being defined, in fast and loose terms, as commentary and criticism, or parody. All of these abound in any fan forum worth its salt. However, fair use is mostly applicable to works of art that have already been offered up to the public. Spoilers from an episode that won’t air until pumpkin-spice season might not make the cut. The amateur experts who have glutted YouTube with their own predictions (a simple search of “Walking Dead Negan Death theory” yields about 32,500 results) are more clearly aligned with fair use. They are, in essence, using clips and images from the finale to make their own unique commentary and predictions: finding the symbolism in the discovery of a can of Orange Crush from a pre-Negan episode, suggesting that one carrot-topped character would get his head—well, you get the idea. AMC appreciates every fan and welcomes conversation and speculation around our shows. We also take very seriously our responsibility to protect the vast majority of fans who do not want their viewing experience spoiled and will take appropriate steps to prevent the release of stolen or confidential information. So it seems that putting on your Sherlock cap—or, better yet, your guts-smeared poncho—and wandering into the gnashing horde of speculations is not, in and of itself, inherently problematic from a copyright perspective. That said, preventing this particular spoiler from leaking seems nigh impossible, given that many Walking Dead looky-loos and scoop hounds are getting close enough to the Georgia-based sets to snap photos of certain characters looking very much alive (if worse for the wear). The 100th issue of The Walking Dead comic book already offers—in a sequence of panels that are now iconic in their grotesquery—a very plausible candidate for doom in Glenn Rhee. Although, given the show’s penchant for remixing character deaths, actually preserving this one from the comic would be the real shocker. One wonders if this summer-long slow-burn process of elimination might, in some ways, negate the impact that TSDF might actually have on the overall success of the show. And one might argue that the real purpose of the cease and desist is, to paraphrase Negan himself, more about sending TSDF and sites like it to “Pee-Pee Pants City,” as opposed to a matter for the courts. Still, AMC has arguably built much of its marketing campaign for season seven around the inevitable reveal: In the letter it sent to TSDF, AMC refers to the Lucille victim as “the most critical plot information in the unreleased next season of The Walking Dead”—which indicates that the studio does believe that this spoiler could be bad for business. And business is booming: In 2015 alone, The Walking Dead drove a 25 percent boost in ad revenue. Though many viewers may only consider the end product, making any TV show—particularly a large-ensemble, FX-heavy show like Game Of Thrones or The Walking Dead—is a significant financial investment that can cost millions of dollars per episode. And that investment is a huge factor in copyright law. As Verna says, “Copyright law is all about protecting the ability [to make] an income from artwork. We have a work that takes a lot of people and a lot of resources that generate a lot of money.” There are no clear and specific barometers to gauge whether, or how much, the leak of this particular spoiler could hurt the show. After all, TSDF and other sites did leak audio of Negan’s brutal debut days before the finale—and season six still ended with 14.8 million in total viewership. That’s down, admittedly, from the series high of the season-five finale, but still a ratings gain of 15 percent from the mid-season finale cliffhanger (which, in case you forgot, was resolved via deus ex dumpster). Yet the fact that we’re still talking about this cliffhanger, still reading interviews where cast members talk about how much they cried after reading the script, and still making and watching YouTube speculation videos and visiting sites like TSDF is a testament to the enduring interest in this particular spoiler. The cliffhanger was initially dismissed as a moment of crass commercialism, rather than an ending that truly served the material—and, if anything, this fresh blitz of commercials, ads, and magazine features revolving the cliffhanger only supports that view. So it’s easy to understand why fans want to know which character they’ll be grieving when season seven of The Walking Dead starts. But it’s also easy to understand why, lumbering into the seventh season of an expensive show, AMC would gamble on the intrigue—and why it would try to protect its material. Of course, people who really want to know can likely sniff out the character who met his or her end in a crash of metal and wood easily enough. But for the rest of us, there’s always October 23.